The CRP test measures the level of inflammation you have in your arteries and is a simple test that can detect heart disease. Heart Disease is now the number one killer of women partly because the symptoms are ignored, the CRP test is a good indicator of your heart health. Using this home CRP test, your blood sample is sent to a CLIA certified lab and your results are then available on a secure website. Coronary Heart Disease can be detected early with C-Reactive Protein Tests. C-reactive protein (CRP) is a substance produced by the liver and its levels increase during periods of inflammation. Though not condition specific, inflammation is a significant indicator of health problems such as coronary heart disease. Early detection of coronary heart disease is possible with a C-Reactive Protein Test. Everyone is used to monitoring their cholesterol and blood pressure, however CRP levels are not as widely talked about. Healthy men and women with normal cholesterol levels are still at risk for future heart attack if they have elevated levels of CRP. A person's CRP levels are elevated for a reason - and that reason quite often is inflammation of the artery walls. According to the American Heart Association, scientific studies have found that the higher the CRP level, the higher the risk of having a heart attack. In fact, the risk for heart attack in people in the upper third of CRP levels has been determined to be twice that of those whose CRP level is in the lower third. If CRP level is lower than 1.0 mg/L, a person has a low risk of developing cardiovascular disease. If CRP is between 1.0 and 3.0 mg/L, a person has an average risk. 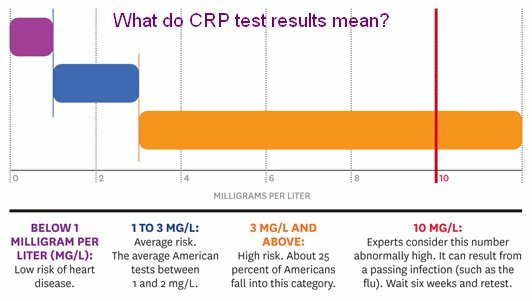 If CRP is higher than 3.0 mg/L, a person is at high risk. Many factors can cause an increase in a person's CRP levels (osteoarthritis, cancer, a common cold or other infections) but in the absence of any specific disease, an increased CRP level poses a significant risk of coronary heart disease. Elevated levels of CRP is the first indicator of heart disease recommended by the American Heart Association in over 20 years and can be detected with a high sensitivity C-Reactive Protein Test (hs-CRP). The high sensitivity C-Reactive Protein Test combines the convenience of a home sample collection with the accuracy of a certified clinical laboratory determination. The hs-CRP Test adds an important additional piece of information to a doctor's traditional assessment of overall cardiac health. When the arteries around the heart become inflamed by atherosclerosis, a person's CRP levels become elevated. Even in the absence of traditional blockages, inflamed artery walls can become softened and develop weak areas that can suddenly rupture. Plaque also develops more quickly in inflamed arteries, increasing the risks of heart attack or stroke. The major factors that promote coronary heart disease - cigarette smoking, high blood pressure, atherosclerosis, and high blood sugar - are well established. These risk factors give rise to a variety of noxious stimuli that cause the release of chemicals and the activation of cells involved in the inflammatory process. These events are thought to contribute not only to the formation of plaque but may also contribute to its disruption resulting in the formation of a blood clot. Thus, virtually every step in the development of plaque is believed to involve substances involved in the inflammatory response and cells that are characteristic of inflammation. C-reactive protein levels are used mainly as an indication of inflammation. Measuring and charting C-Reactive Protein levels can prove useful in determining disease progress or the effectiveness of treatments. Blood has been traditionally collected in a serum-separating tube and analyzed in a medical laboratory, however, today labs have developed a revolutionary new way to collect, store, and transport micro-sample blood specimens for laboratory analysis using a patented blood collection card. It supersedes all previous collection methods in its ease of use and accuracy. The high sensitivity C-Reactive Protein Test provides the same clinical results that can be obtained from a local laboratory, but without the inconvenience of keeping an appointment and the need to draw blood from the arm. The process is very quick and virtually painless. A special finger lancet is supplied in the Blood Collection Kit. With it, four drops of blood are taken from a micro-nick of the finger, placed on a special collection card to dry, inserted into the special mailer provided, and then sent (postage paid) to a CLIA certified laboratory for analysis. 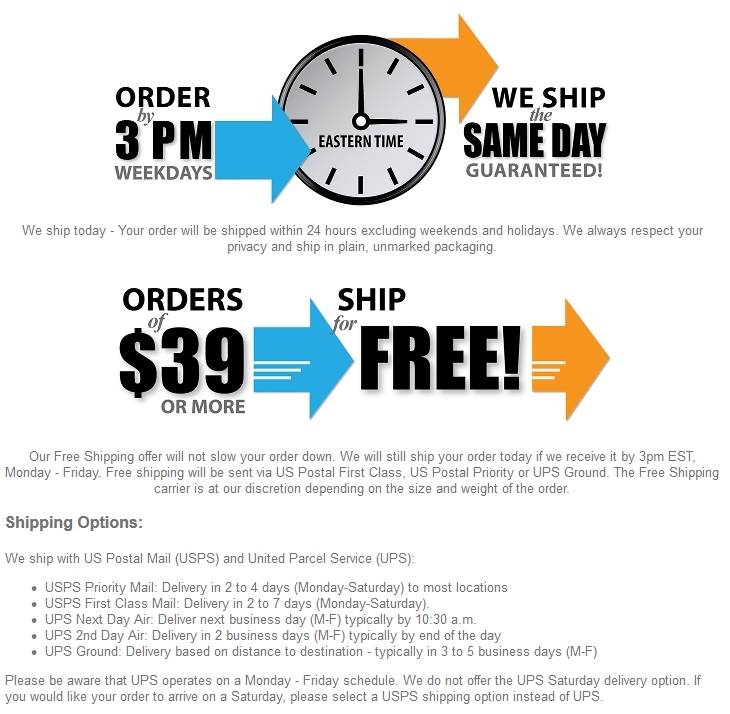 Allow 5-7 days for delivery of your sample to the lab and an additional 3-5 days for processing. You will receive an email when your results are available online at https://www.dbslabportal.com/. Total turnaround time is approximately 3 weeks. 1. Complete Test Requisition and consent form. 2. Take Blood Collection Device from foil pouch and affix barcode label to the top/lid of green device so it will show when closed. 3. Wash hands with warm water and dry thoroughly. Clean with alcohol pad. 7. After blood is absorbed, close the green device firmly by folding over the top. Make sure the latches are secure and your barcode label shows on lid when it is closed. 9. Allow 5-7 days for delivery of your sample to the lab and an additional 3-5 days for processing. Your results will be available online at on https://www.dbslabportal.com/. If you are unable to retrieve your test results, you must call the lab directly at 816-425-1690 between 9am-4pm CST. Q: What will show on my test results? A: A number showing the mg/L or milligrams per liter which represents the presence of the c-reactive protein in your blood.